So you have a sneaking suspicion that your company would benefit from a scratchcard promotion but don’t know where to start. I’m discussing short runs of between 1,000 and 50,000 copies in this article as once you get into much bigger quantities the machinery required to produce them economically requires a different approach. In real life A6 (148 x 105mm) and A5 (148 x 210mm) are the most popular sizes, entirely due to economics. The cards are printed on sheets that are multiples of the basic A4 size so there’s less wastage with these sizes. Again, real life normally limits this to the hundreds of thousands of shades available with 4 process colours but if you really must have a lurid lime green or “that” particular pastel colour then any printable colour is available. The most common combination is to have full colour (from the process colours) on one side and then just black on the back for the dreaded Ts & Cs. Nearly all games are derived from a very simple “match the pictures” formula. This is ideally suited to promotional cards as brand values can be enhanced by using the product itself. 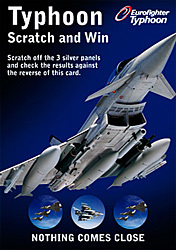 For example, we produced a batch of cards for Eurofighter to be used at the Farnborough and Berlin air shows and the game featured a series of different pictures of the plane itself so it didn’t matter which scratch-off was removed there was always a pic of the plane waiting underneath. Exactly the same idea can be used whether you’re promoting a bar (match the bottles anybody?) 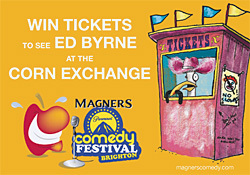 or a comedy festival. As the cards are printed on much larger sheets, the relative quantities of winning and losing cards can be carefully controlled and monitored. Cards can be either randomly shuffled together or kept separate. These follow a formula: “The British Code of Advertising and Sales Promotion” established by the Advertising Standards Authority. Apart from restrictions on what you can and can’t promote to children, there are two broad categories: with or without a required purchase. Once we know which category the promotion falls within it’s out with the boilerplate and time to fill in the gaps so it’s not something you really need to worry about as we can lead you through the whole process. And that’s about all there is to it! This entry was posted in Design and tagged promotional scratchcards, scratch cards by Pete. Bookmark the permalink. I came across in this article bookmarked and i genuinely enjoyed what i read. will obviously take note of it too along with experience your current several other content articles later. Hey admin, very informative blog post! Pleasee continue this awesome work..
good stuff :), how long has this blog been going for?? ?